The title makes this challenging little game sound a lot more naughty than it is. Clock Blocks does, in fact, feature clocks in the shape of blocks, no saucy innuendo involved. 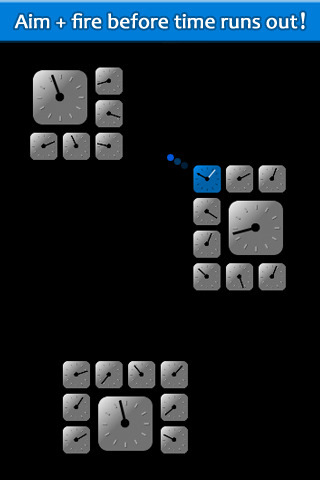 A simple action puzzler that is a lot more addictive than you might think at first glance, Clock Blocks is easy enough to pick up, but requires a fair amount of vigilance to master. There are three different play modes to choose from, but they all involve the same basic mechanic. 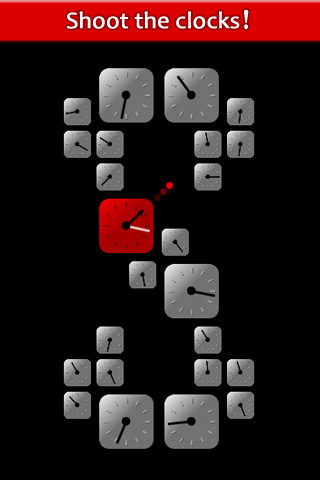 You start with a series of clocks laid out in a grid, hands rotating in all different directions. A colored bullet shoots out and hits a clock. The clock face then turns the same color as the ball. The hand keeps rotating, only now it’s a shooter. Tapping the screen causes the bullet to shoot in whatever direction the hand is pointing at that moment, and destroys the clock. Sounds complicated, but I assure you, it’s easy once you try it. The object of the game is to destroy all the clocks, so you always want the bullet to hit another clock, and if you shoot it into a wall, the game is over. The game is also over if you don’t shoot the bullet before the clock makes one complete rotation. In Classic mode, you just have a full grid of clocks to obliterate, while Survival keeps adding new clocks as you play, and you go for as long as you can. Quest mode presents different arrangements of clocks in the grid, so there’s more of a strategic puzzle element rather than just quick thinking and fast reflexes. Classic and Survival mode each come with four different difficulty levels, so you can start off as simple or challenging as you like. Beyond that, there’s really not much else to say. You can change the color of the bullet if you like, but the graphics themselves are Retina-optimized, but they’re fairly dull and utilitarian, and the music is not very good. A more serious omission are social elements, since there are no high score tables to compare with friends or people online. This lack of social connection is made somewhat more awkward by the blatant link on the main menu to the developer’s Facebook page, but no Facebook Connect. The game itself is simple to play and easy to get sucked into, but while the premise is somewhat original, the overall presentation is fairly bland. Clock Blocks definitely has its charms, but with a name like that, I was expecting something with a lot more character and humor, while this is about as basic and plain as you can get. Still, it’s worth a try, and if you’re interested in trying it out before buying, it’s available to play for free at http://80dgames.com/clockblocks/. AppSafari review of Clock Blocks was written by Tracy Yonemoto on October 28th, 2010 and categorized under Action, App Store, Games, iPad apps, Puzzler, Strategy. Page viewed 5152 times, 1 so far today. Need help on using these apps? Please read the Help Page. I like this game… you say there is no social component, but it has Game Center leaderboards. If you get into the swing of it…there is a rhythm. It is a focused rush which you can sustain for a long time if you work at it. I feel like I’ve cleaned the cobwebs out of my brain when I play for a bit. Clock Blocks grows on you. unique & intuitive concept, varying degrees of difficulty, definite re-playability… and Game Center integration! My review was based on a earlier version, and the Game Center integration is a recent addition, but I’m very glad to see it.